19-years-young and she has a remarkably strong and distinctive voice — Ella Eyre will headline her very first solo UK tour in the coming year. Ella had her breakthrough year this year when she featured on Rudimentals hit single ‘Waiting All Night’, off their debut album ‘Home’ - which was Ella's first number 1 single on the UK charts. She also appeared on Naughty Boy's track ‘Think About It’ alongside rapper Wiz Khalifa, and also on Tinie Tempah's ‘Demonstration’ album on a track titled ‘Someday (A Place in the Sun)’. March 2014 will see the singing sensation hit the road gracing the stage at right different venues across the nation for her tour. And is promised to have special guests on the nights as well. 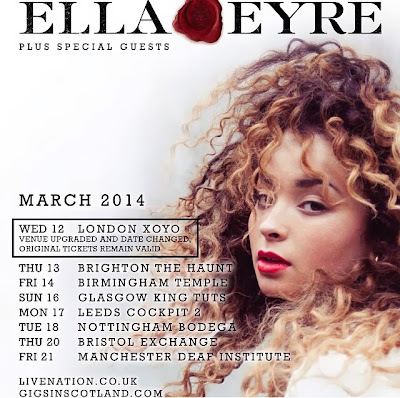 Below are the tour dates and Ella Eyre's new EP ‘Deeper’ is out now and was released via Virgin/EMI records a couple weeks back. So be sure to cop that off iTunes.